The words of the Old Testament prophet Amos appear in the book of the Bible that bears his name. The words come to him in a vision. But the Bible doesn’t tell us the circumstances surrounding the vision or how it occurred. The vision may have come to Amos at night in a dream or in that early-morning time between the unconsciousness of sleep and the consciousness of being awake. Or perhaps the vision came to Amos as he was praying or fasting or meditating. Regardless of the details, God speaks to Amos in a vision. Some of the other prophets also have visions but not all. For other prophets, such as Jeremiah, the Bible simply says that the word came to them. And God spoke directly to Jacob, Moses, Samuel, Job, and Isaiah. Other times, angels serve as messengers to carry God’s word to his emissaries. Regardless of the process, however, God speaks to his people. It may be through a vision, words, or thoughts. It may be through an angel, a person, or another means. The method doesn’t matter but the message does. When Amos receives his vision, he proclaims it to the people. A scribe records it for us to read in the Bible. In this way, Amos is faithful to his vision. 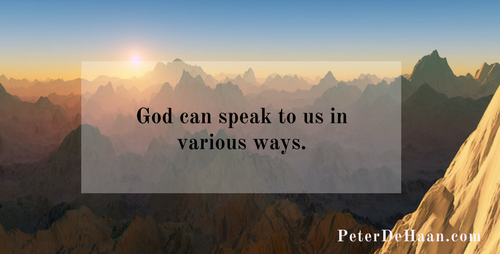 God speaks to him, and he shares it with others. God speaks to us, too. Are we ready to listen to what he says? And when we hear, are we faithful to say or do what he says?